Your local hospitality committee is excited to invite you to participate in two special events this March 21st. We will begin the day at 7am in the lobby of the Marriott hotel for the Jim Berlin Fun Run and close the night at with the the Pub Crawl in Historic Ybor City at 7pm. 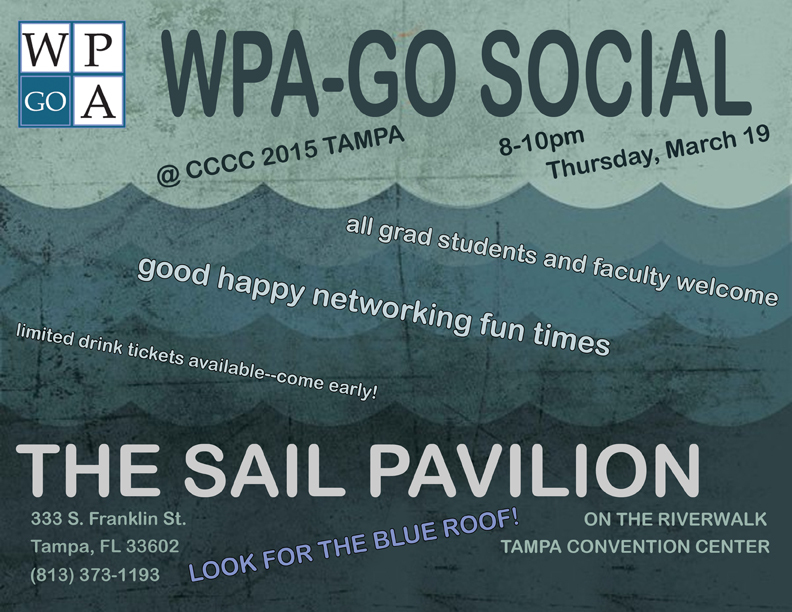 Additionally, the WPA-GO (the Writing Program Administrators–Graduate Organization) cordially invites all graduate students and faculty to join them for the annual CCCC social. Join WPA-Go from 8:00-10:00pm on Thursday 19 March. The social will be at the Sail Pavilion on the Tampa RiverWalk, located between the Convention Center and the Tampa Marriott Waterside. Just look for the blue roof. WPA-GO will provide a limited supply of drink vouchers—come get them while they last! Please circulate the attached flyer (or our Facebook event) widely; we look forward to seeing you in Tampa. We look forward to seeing you at these special events! Local updates, information, and fun stuff to do in Tampa. Use #4c15 for conference tweets!